This post contains affiliate links. If you make an Amazon purchase through our links, we get a little kickback to but it doesn’t cost you anything extra. Thanks for supporting our family business! LOVE HEARTY SOUPS LIKE THIS? CHECK OUT OUR HAM AND BEAN SOUP RECIPE! To decide what lentils you should use in Instant Pot Lentil Soup, you should know a little bit about each variety. The brown lentil has a mild earthy flavor, and holds its shape really well after cooking. I love the texture they give soups. Red lentils have a nutty flavor with a slight sweetness. I find they are usually more orange than red. Red lentils don’t hold their shape much after cooking so are great for thickening soups. 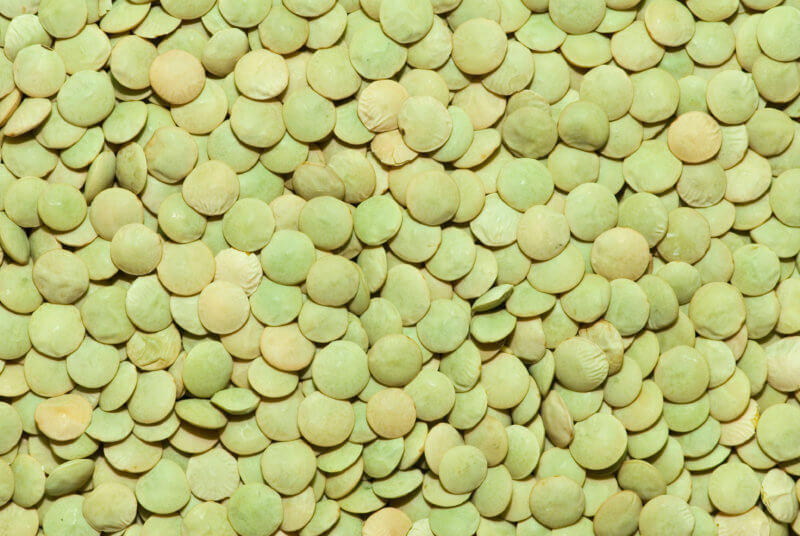 Green lentils have a bit of a peppery flavor to them, and also hold their shape well after cooking. Green lentils require the longest cooking time of all the lentil varieties. I used brown lentils for this Instant Pot Lentil Soup, but you could also go with green if you prefer that flavor. I would not recommend red lentils as they will turn to mush. I feel like the term healthy is so relative, and means different things to different people. So, is Lentil Soup healthy? Well, there are a lot of potential health benefits to eating lentils. Lentils are legumes, and are high in soluble fiber. This can help with lowering cholesterol, and reducing risks of heart disease. Soluble fiber also slows digestion, which can stabilize blood sugar levels. 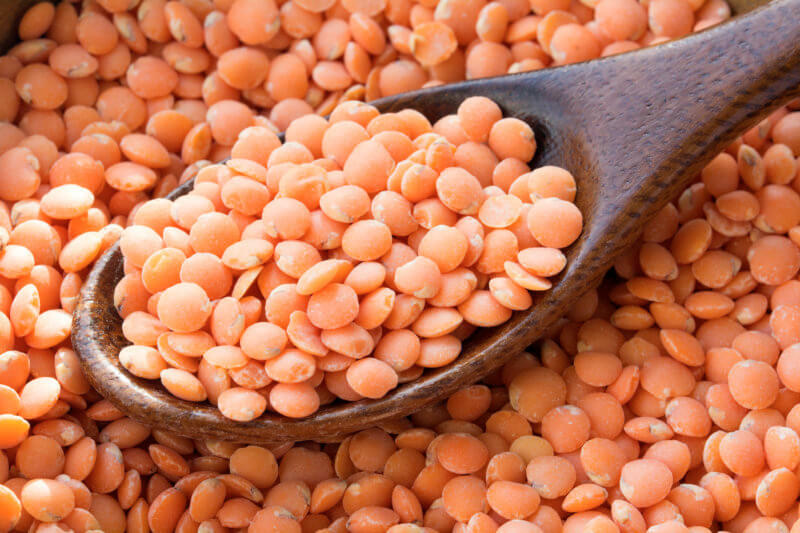 The insoluble fiber in lentils can help with digestive health, preventing constipation. I know right? Fun topic for a food blog. 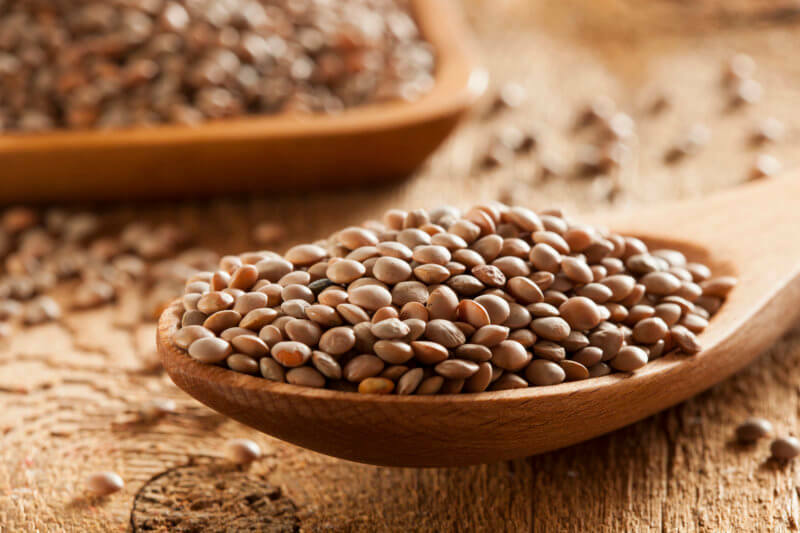 Lentils are also high in magnesium, which can help keep things flowing as well. 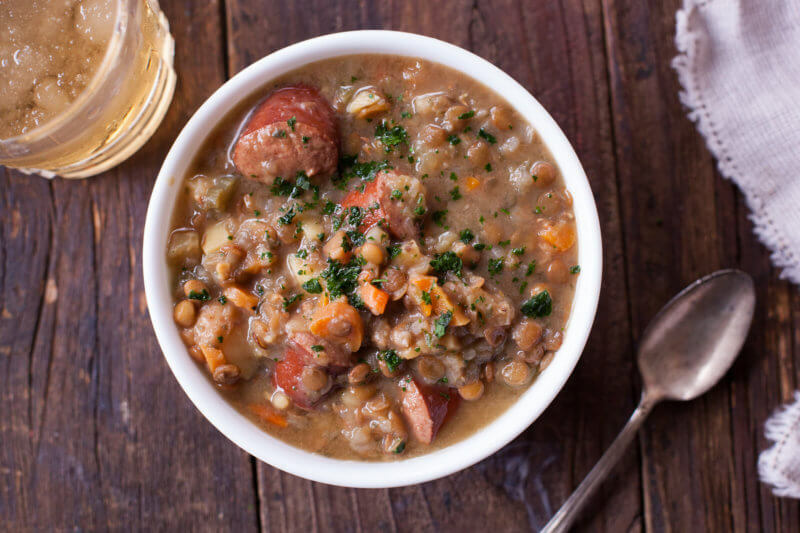 Lentils are super high in protein, meaning you could even skip the sausage, and this Instant Pot Lentil Soup would still be protein packed. The iron content, fiber, and complex carbohydrates in lentils give you slow burning energy. The iron also helps in transporting oxygen through your blood which is great for energy and metabolism. Lentils are low in calories, but great at filling you up and satisfying your appetite. So yes, this Instant Pot Lentil Soup is healthy. It’s packed with beneficial nutrients, and low in calories while still filling you up. 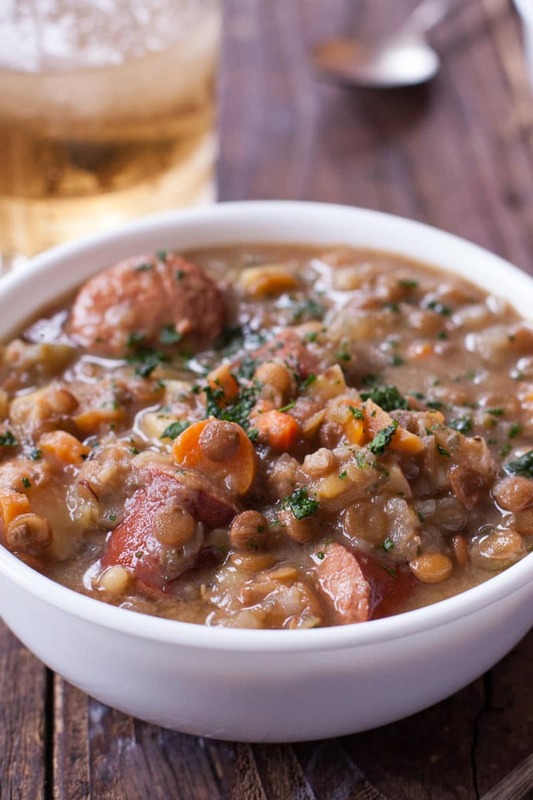 I use a lean turkey kielbasa, to make lentil soup even healthier. LOOKING FOR A LOW CARB SOUP RECIPE? TRY OUR CARROT TOMATO SOUP RECIPE. MAKE IT WITH CANNED OR FRESH TOMATOES! DO LENTILS GIVE YOU GAS? I just have to address this one. Especially as a pregnant mama who not only needs to avoid that uncomfortable pressure, but also gets sick if I smell it from anyone else. Any high fiber food can cause bloating, especially if you are sensitive to fiber, or not used to eating it. Lentils also contain FODMAPs, which are sugars that can contribute to excessive gas or bloating in sensitive individuals. I have heard that soaking and rinsing lentils before using can help reduce this issue. Just like with beans. If you do decide to soak your lentils first, I’d suggest adjusting your cook time for the Instant Pot Lentil Soup. Just cook for 10 minutes on the soup setting so you don’t turn the lentils to mush. 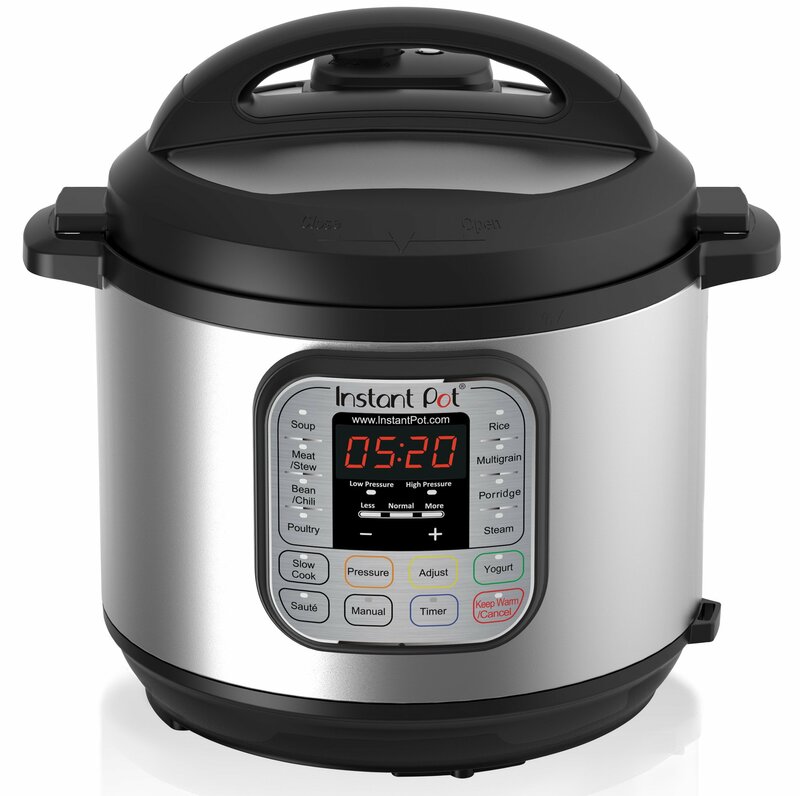 If you’re brand new to using theInstant Pot electric pressure cooker, it can be a little intimidating. I have some food blogger friends who have owned one for two years and still haven’t even opened the box! 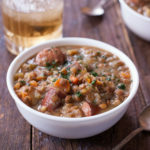 But the Instant Pot is actually incredibly easy to use, and this Instant Pot Lentil Soup is a great recipe to start with. Here’s a really great starter post on how to set up your Instant Pot. Once it’s set up, here are a few important steps to make sure your Instant Pot experience is successful. Make sure your sealing ring is sitting securely in the lid. You should be able to turn the silicone ring within the lid if it is on properly. Make sure the release valve on top of the lid is set to sealing. When all your ingredients are in, put the lid on and turn until you hear the Instant Pot beep to signal it is closed. Press the Soup button, then use the + or – buttons to change the numbers to 20. This will be your cook time once the pot comes up to pressure. Now you just wait! The Instant Pot display will switch to say “On”. Once it comes to pressure, the display will start counting down from 20. When the Instant Pot Lentil Soup is done, the display will switch to 0:00 and start counting up. This is to let you know how long it has been since it switched from cooking time to warming time (and started releasing pressure). At this point you can carefully place one finger under the pressure release valve, then lift and turn it to venting. The steam shoots out the top of the valve, so you will not get burned as long as your finger is underneath. Make sure to keep your face away as well. This is called the quick release method. If you are nervous about the steam, you can do a natural release. Just check on the pot after the timer has counted up to 10-15 minutes. If the pressure has all been released, you will be able to easily turn and open the lid. If not, the Instant Pot won’t let you open. No danger! Ready to get cooking? Here’s step by step instructions for making Instant Pot Lentil Soup. Start by prepping your ingredients. Chop up a cup each of onion, celery, carrots, and potato. You will also need a couple tablespoons of chopped parsley and a teaspoon of minced garlic (or two cloves). Cut your kielbasa sausage into 1 inch thick pieces. Rinse one cup of brown lentils, and drain in a colander. 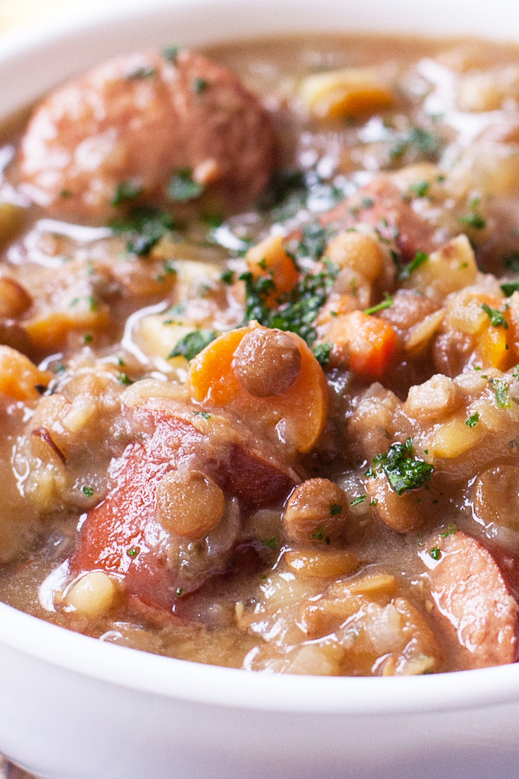 Place the lentils, onion, celery, carrots, potato, parsley, garlic, and sausage into the Instant Pot. Add 6 cups (48 ounces) of beef broth, a teaspoon of kosher salt, ½ teaspoon of fresh ground pepper, and ⅛ teaspoon of nutmeg. Give everything a quick stir. Place the lid on the Instant Pot and make sure the pressure release valve is set to sealing. Cook on the soup setting for 20 minutes and use quick release method when done. You can also make this Instant Pot Lentil Soup Recipe in a crockpot. Or by using the crockpot setting on your Instant Pot. Simply follow the same prep instructions, but cook it on low heat for 6 hours. Make sure to stir the soup occasionally as it cooks. 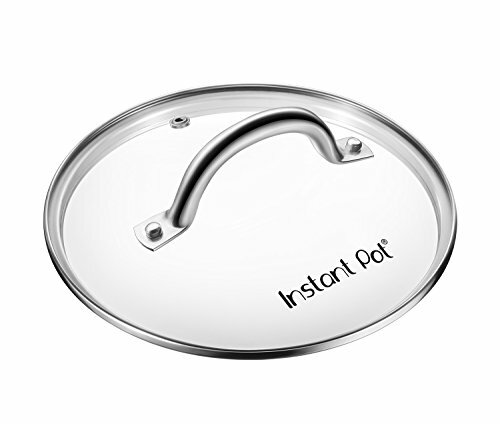 If you plan to use your Instant Pot’s crockpot setting, I highly recommend getting one of these glass lids. It lets steam escape like a regular slow cooker, and also lets you check on your food and stir it during cooking. Don’t lose this recipe! 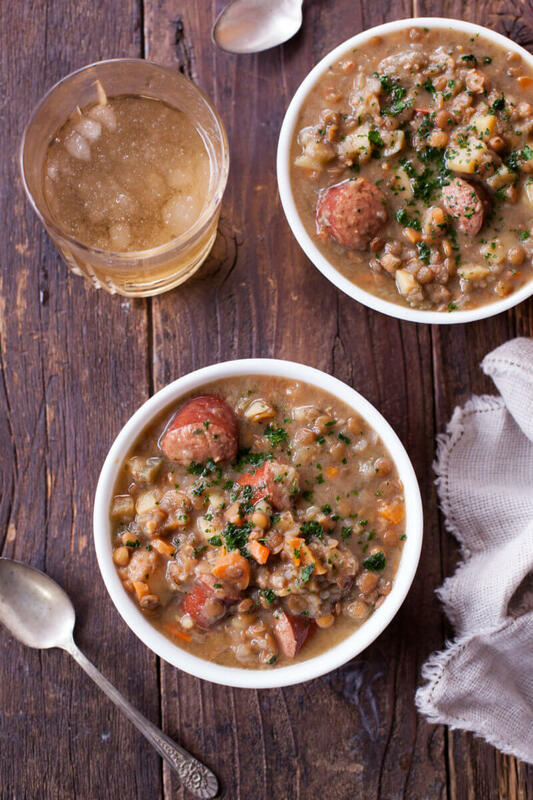 Make sure to save this Instant Pot Lentil Soup to Pinterest. Instant Pot Lentil Soup is an easy, hearty, comforting meal. But the best part is how fast and easy it is to make. Simply toss everything in the Instant Pot, and you'll have amazing lentil soup in about 30 minutes. This Instant Pot Soup is both gluten free and dairy free as well. While the cook time is 20 minutes, you will need to allow about 10-15 extra minutes for the pot to get up to pressure. Slice kielbasa into pieces 1 inch thick. Place kielbasa, onion, celery, carrot, potato, parsley, and garlic into Instant Pot. Rinse and drain lentils, then add to Instant Pot. Add beef broth, salt, pepper, and nutmeg. Stir to mix. Place Instant Pot lid on with pressure release valve sealed. Cook for 20 minutes on the soup setting. When done, use the quick release method to release pressure before opening.